All of our Thailand itineraries are tailor-made for each individual client, according to their requirements and preferences. We do not sell pre-packaged trips of any kind. However, to show you how some of our trips can fit together, and the kind of holidays that previous clients have taken, we have laid out here a few examples. These are for example purposes only and should not be taken restrictively. Your trip can include a combination of any parts of these itineraries - the only limitations are your budget and your timeframe! Experience the essence of Thailand in this luxury itinerary which includes Bangkok, the Golden Triangle and beautiful Koh Samui. 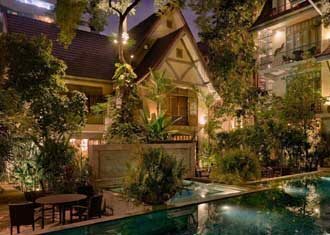 This small family run boutique hotel is a small piece of heaven in central Bangkok, once inside you feel the tiredness leave you as you begin to relax with its cooling and refreshing atmosphere. Set high in the hills around the Golden Triangle, the Anantara is a luxury hotel in rural northern Thailand with stunning views over the surrounding paddy fields and onto Laos and Burma. Nestled amidst swaying palms and clear waters the luxurious Napasai offers unparalleled opulence on Mae Nam Beach on the idyllic island of Koh Samui.